This weekend was pretty productive! I never thought home shopping could be both fun and stressful! For the past two days, I have been at SM Megamall checking out linens, bed covers, mattresses and a lot more! All these in preparation for our future rooms that need to be furnished pretty soon. I realized that no amount of time spent going over the beautiful pages of Real Living is enough to prepare me for the great battle... to be in front of close to a hundred choices. SM surely wasn't kidding when they said they got it all for us! After our last shopping session today, I took some time out to chill out at The Stick House -- my newest discovery located at the basement of SM Megamall Bldg A. They have around 7 possible flavors and more combination as you first choose your stick -- would you like to get a gelato or a sorbet. 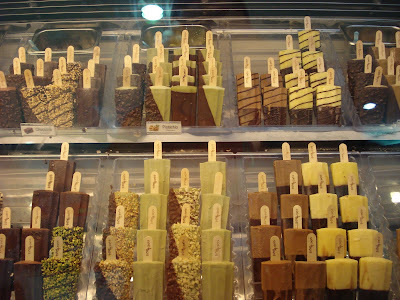 Then you choose your toppings: Coffee, Hazelnuts, Almonds, Pistachio? You may also opt to dip your gelato stick into their delicious chocolate syrup. It took me a while to decide on my order. At some point I felt like a little kid in front of the cold ice cream freezer confused with a dozen possibilities. Finally, I chose the Strawberry Sorbet stick (Php. 60). I took a bite and it brought back wonderful memories of me with my parents at the lobby of the Peninsula Manila hotel. Ok, so the sorbet of the Peninsula was really extra special but the flavor of Stick House's Strawberry Sorbet was pretty good too. I had a great time cooling down with my delicious sorbet stick. This is definitely one thing I will look forward to on my future shopping trips. 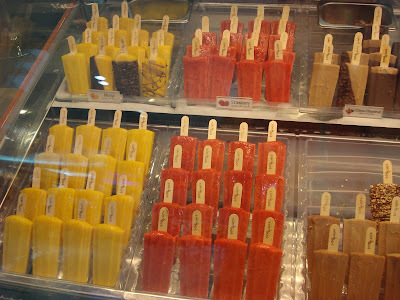 Stick House (Italian Gelato on a Stick) is located at the Lower Ground Floor, Bldg A of SM Megamall, Mandaluyong City. My idea is to go slow fixing! :^) I moved in to my house a little less than a year ago and my walls are still empty! No stress!